To kick off our summer, we will be meeting at Bogart Park in Cherry Valley Day Use Area #1 (close to the playground). There will be worship, songs, and a craft for your kids. Our theme for the morning is “fruit of the Spirit.” All families in Cradle Roll and Tiny Tots are invited to join us starting at 10am. 1.Picnic Potluck Lunch: Please bring entree & salad/vegetable. Service ware, drinks, desserts will be provided! 1. Traveling East bound on I-10 from the Calimesa Church take the Cherry Valley Blvd exit. 2. Turn left on Cherry Valley Blvd. Stay on road until it dead ends. 3. Turn Left on Noble. 4. Turn Right on Dutton. 5. Turn Left on Cherry Ave.
7. Enter Bogart Park, proceed to Day use area #1. 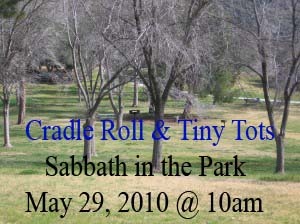 *There will be a joint Sabbath School in the Cradle Roll Classroom for those that are unable to meet at Bogart Park. Calimesa Church takes steps to ensure kid’s safety!